How do you cook up the perfect bubbling stew of controversy in the Middleton-Cross Plains Area School District? Just combine religion, public schools, a city park and the First Amendment. Then throw in a smattering of attorneys and social media hyperbole for good measure. That’s what happened last week when everyone in the community seemed to be staking out a vehement position on “Jesus Lunches,” a series of events at which the mothers of local high school students have been talking about their Christian faith and handing out free food to a growing number of local teens. While the lunches have been occurring periodically for a couple years now, it was last week that the Middleton-Cross Plains Area School District went public with the details of its ongoing concerns about the events. The district says the lunches occur at Fireman’s Park, directly adjacent to Middleton High School, on school days. The park, which is a public municipal space owned by the City of Middleton, is rented by the school district, which says it enforces district rules during the school day. Public schools are prohibited from providing religious instruction, and parents are prohibited from organizing events on school grounds without the district’s permission. The district also says the lunches could violate regulations regarding the distribution of food to students during the school day. Supporters of Jesus Lunches disagree. Strongly. They contend that they are inspiring students and preaching the Gospel of Jesus Christ at a public park where the First Amendment clearly protects their basic right to free speech. Some students, both theists and atheists alike, have raised concerns that the lunches are a divisive force in the school community. Others, once again both those who are religious and those who are not, say the group’s right to free speech is worth fighting for, regardless of what they are saying. Various media outlets were quick to jump on the story – liberal ones tended to slant their articles in favor of the school district, while conservative ones spun the story in favor of the Jesus Lunch organizers. The controversy also sparked lively, sometimes emotional debate at the local level, as well, with many a Facebook thread spiraling into the dreaded land of vitriol, partisan politics and name calling. As of this week, the City of Middleton, along with its police force, appear to agree that the Jesus Lunches are a protected form of free speech. That stance means other groups – Muslims, Buddhists, Pagans, atheists groups, the Church of Satan, and others – would all be able to hold similar events at Fireman’s Park during the school day. Students on both sides of the issue were in agreement on one thing: The Jesus Lunch controversy has created a tense, uncomfortable atmosphere at Middleton High School. Clare Day, a junior, has been attending the lunches since their inception. “It’s a great experience to be around people who feel the same way I do,” she stated. But the issue has stirred up strong emotions, which have led to palpable anxiety among students, Day added. Arguments on social media have only added fuel to the fire, she continued. Lew Blank, also a junior, identifies as an atheist and opposes the lunches for several reasons. But both Blank and Day were in total agreement about how high emotions are running within the school community. While the lunches have been debated internally for some time, it was a statement released by Middleton High School principal Stephen Plank and Middleton-Cross Plains Area superintendent Don Johnson that laid out, for the public, the district’s position early last week. “There is a small group of parents who have been organizing free lunches at Middleton High School over the past year,” said Johnson and Plank. In both cases of the south lawn and off campus locations, Plank expressed an opposition to the event and said they violated school and district policy. Jesus Lunch organizers then went to the City of Middleton and reserved Fireman’s Park starting in September of 2015, according to the district. According to the district, anyone providing food for students must follow the district’s food handling standards found in the district Food Safety Plan. In addition, many students are subject to food allergies, so additional protocols must be followed to safeguard students with these conditions, they said. A parent group bringing large quantities of food to a school also raises significant questions regarding whether it is, in fact, an adult organized event that has not followed Administrative Policy 371, they added. In addition, adult visitors to school and the school’s campus must follow Administrative Policy 860 Visitors to the Schools, which requires registering in the school office, or the greeter’s station, the district said. As the district consulted legal counsel for an opinion about its lease of Fireman’s Park, Plank again asked the parents to cancel the event. 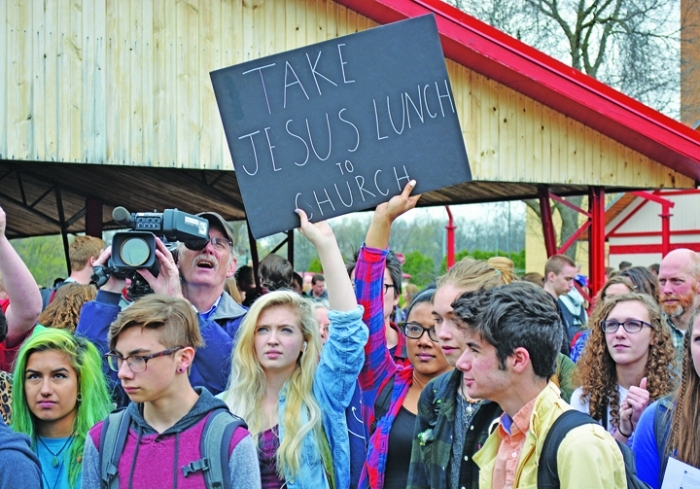 Jesus Lunch organizers said they intended to continue organizing the lunches, pointing out that they were taking place at a city park, not at the high school. “Instead of acknowledging and abiding by the District’s policies, the parents have threatened legal action against the district,” said Johnson and Plank. Beth Williams, a Middleton High School parent, is among the mothers who first began organizing Jesus Lunches. She said adult parents have every right to hold religious events at Fireman’s Park, including during the school day. She said she has no desire to be in conflict with the school district, and she had no intention of setting off a national media frenzy. She just, she said, wants to gather in a public place and talk about her faith. Students that attend Jesus Lunch have expressed their desire for Jesus Lunch to continue, according to Williams. She said as many as 500 students sometimes attend. “The reason I love going is because I love sharing my faith, and to be able to share my faith with my friends makes it so much more powerful and builds a great community of faith followers,” Statsick said. “The Jesus Lunch has become the highlight of the week for students and those involved,” Williams added, noting that all five mothers coordinating the events have children in the district. Williams said she would also support the right of other groups — including those that may hold opposing theological views — to hold events at the park. Amy Kortbein, a Middleton resident and the parent of an eighth grader in the district who will enter Middleton High School in the fall of this year, said the events clearly violate the separation of church and state. In the 1948 case “McCollum v. Board of Education,” the United States Supreme Court ruled decisively on the power of a state to use its tax-supported public school system in aid of religious instruction. In it, the court struck down a Champaign, Ill. program as unconstitutional because of the public school system’s involvement in the administration, organization, and support of religious instruction classes. Jesus Lunch organizers counter that they – not the public school district – are funding, organizing, and supporting these events. “While I understand the passion of the adults running Jesus Lunches, it is time for them to move their religious activities to a time and location that are not in violation of the separation of church and state,” she said. Fifteen-year-old Peter Opitz is one of the students who approached school officials with concerns about the Jesus Lunches. Opitz, a practicing Christian who is preparing for his confirmation later this month, said opposition to the events stems from what he believes is a negative impact on the school community, not from anti-religious sentiments. Opitz, along with other students, organized a lunch event of their own on Tuesday of this week at Fireman’s Park. “That lunch will accept all religions, all genders — everyone,” he said before it took place. Opitz voiced concerns over the precedent Jesus Lunches set if they are justified using the First Amendment. As of early this week, the petition had 626 signatures. Many who signed the petition also weighed in on the controversy, saying adults should not be “luring minor children” away from school in order to spread their religious beliefs. Supporters of the lunches subsequently started their own petition. As of Monday, 2,075 people had signed their names in support of the petition. Middleton City Administrator Mike Davis said the city’s agreement with the school district regarding Fireman’s Park has been in place for 16 years. While it does allow the district to use the park, Davis said it also specifically allows for the greater public to use the space. That means everyone, he said, regardless of religious beliefs. As tensions mounted and rhetoric grew more heated toward the end of last week, Middleton Police Chief Chuck Foulke issued his own statement regarding Jesus Lunches.